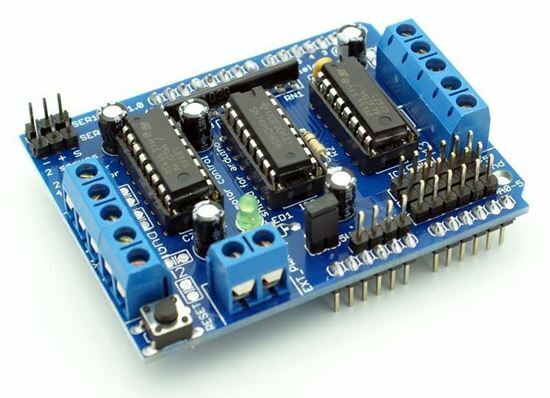 We will learn how to connect L293D H-bridge motor control shield and 2 or 4 DC motors to Arduino board. 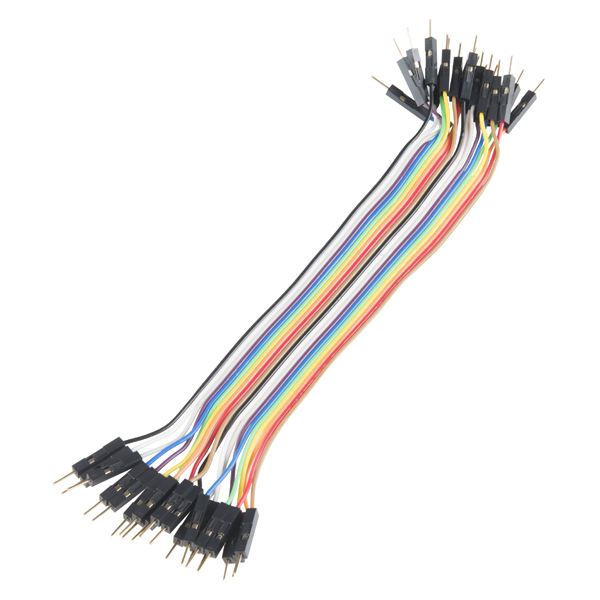 Converts electrical energy into mechanical energy when electricity is applied to its leads. Coils of wire inside the motor become magnetized when current ﬂows through them These magnetic fields attract and repel magnets, causing the shaft to spin. If the direction of the electricity is reversed, the motor will spin in the opposite direction. 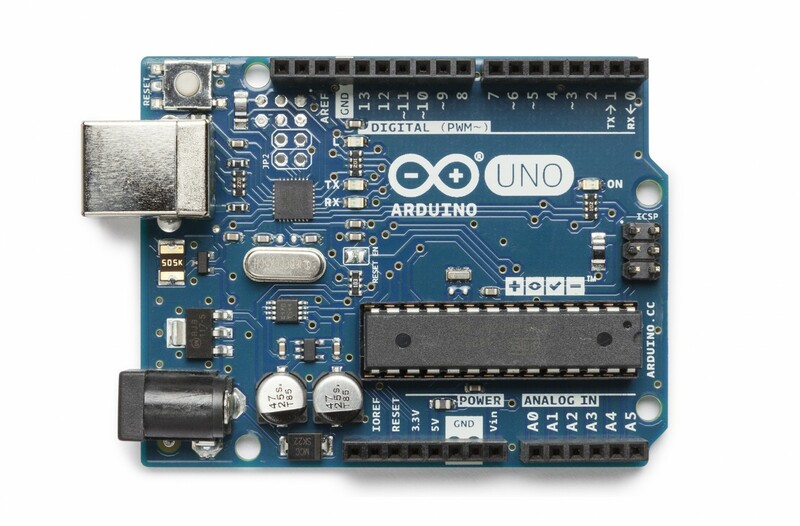 The maximum current of an Arduino I/O port is 20 mA but the drive current of a motor is at least 70 mA. Therefore, we cannot directly use the I/O port to drive the current; instead, we can use an L293D to drive the motor. 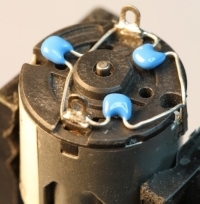 This is a 5V DC motor. Give the two terminals of the copper sheet one high and one low level, and the motor will rotate. For convenient purposes, you can weld the pins to it. Note that the H-bridge chip is not meant for driving loads over 0.6A or that peak over 1.2A so this is for small motors. 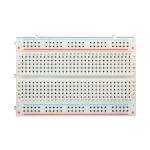 Check the datasheet for information about the motor to verify its OK.
To connect a motor, simply solder two wires to the terminals and then connect them to either the Port1 (M1), Port 2 (M2), Port 3 (M3) or Port 4 (M4) of the L293D motor driver shield. 1. Method. 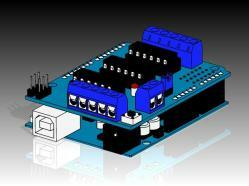 Arduino board powered off of PC USB and DC motors powered off of a DC power supply. DC motors powered from external DC supply connected to the PWR_EXT block on the L293D motor driver shield. Do not place the Power jumper on the L293D motor driver shield. 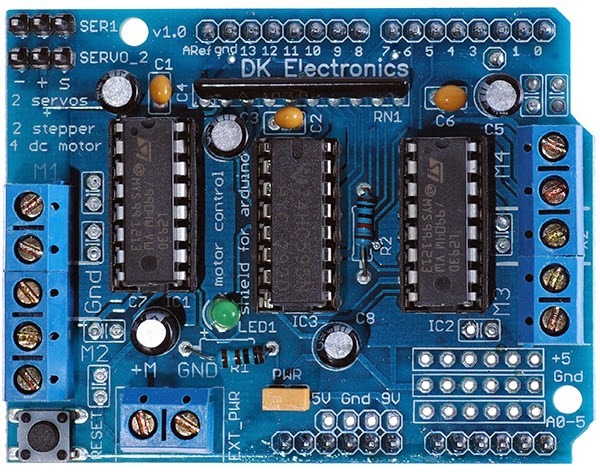 Arduino board powered from PC USB. 2. Method. 2 separate DC power supplies for the Arduino board and motors. 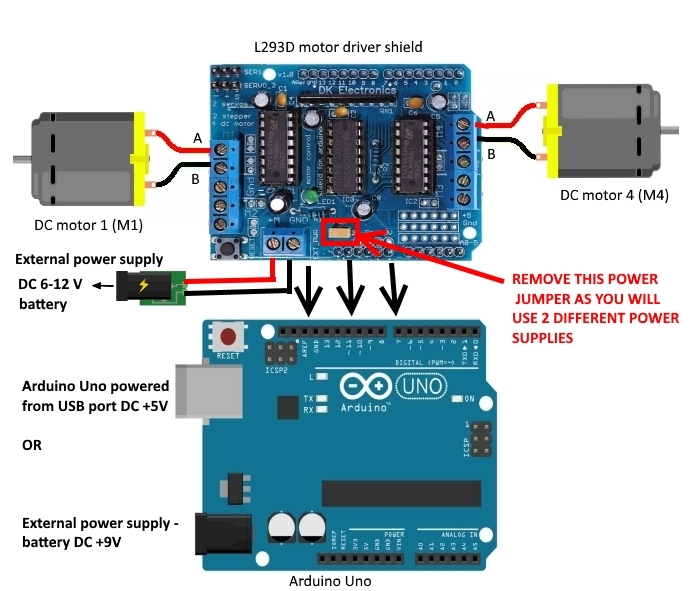 Plug in external supply for the Arduino board into Arduino Board DC jack, and connect the external DC supply for DC motors to the PWR_EXT block on the L293D motor driver shield. Make sure the Power jumper is removed from the L293D motor driver shield. Create the AF_DCMotor object with AF_DCMotor(motor#, frequency), to setup the motor H-bridge and latches. The constructor takes two arguments. The first is which port the motor is connected to, 1, 2, 3 or 4. frequency is how fast the speed controlling signal is. 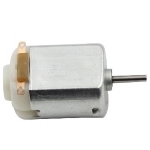 For motors 1 and 2 you can choose MOTOR12_64KHZ, MOTOR12_8KHZ, MOTOR12_2KHZ, or MOTOR12_1KHZ. A high speed like 64KHz wont be audible but a low speed like 1KHz will use less power. Motors 3 & 4 are only possible to run at 1KHz and will ignore any setting given. Then you can set the speed of the motor using setSpeed(speed) where the speed ranges from 0 (stopped) to 255 (full speed). You can set the speed whenever you want. To run the motor, call run(direction) where direction is FORWARD, BACKWARD or RELEASE. 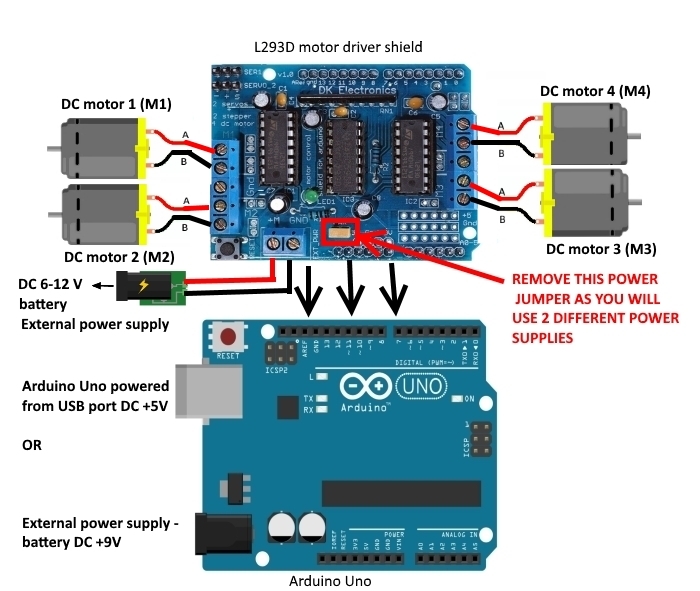 Of course, the Arduino doesn't actually know if the motor is 'forward' or 'backward', so if you want to change which way it thinks is forward, simply swap the two wires from the motor to the shield. 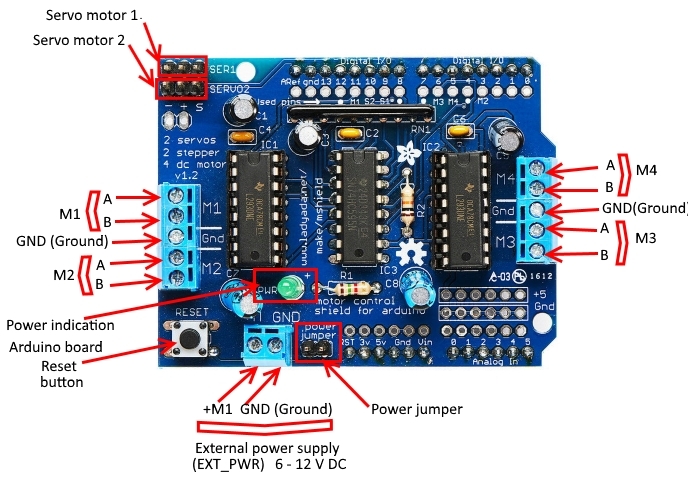 We have learnt how to connect L293D motor control shield and 2 or 4 DC motors to Arduino board.